Although PLAS programming is finished for the semester, there are some campus workshops, scholarships and internships of note, as well as some law school admissions webinars. And…our annual PLAS Internship Newsletter will be posted on our Compass page this WEDNESDAY, DECEMBER 5!! Finally, in case you missed the big announcement last week, registration for the June and July 2019 LSAT administrations will open on December 12! Click here to read last week’s LSAT blog post for more important information about these administrations and scroll down to learn more about upcoming campus events! Applications will be accepted on a rolling basis until December 12th for 2018-2019 Social Justice Education Paraprofessionals! Complete your application here. The Social Justice Educator Paraprofessional Program is a 3-semester peer education program powered by students for students. The Social Justice Education Paraprofessional Program is designed to promote diversity and student leadership by providing intensive training for students in areas of knowledge, awareness, and skills related to issues of diversity and social justice. Through this program, paraprofessionals serve as a campus leaders in social justice by developing and facilitating educational programs for the campus. Social Justice Education Paraprofessionals receive 11 advanced credit hours in Psychology. For more information, click on this link. Please register for one of the Online Information Sessions. Registrants will receive access instructions the day before the online session. If you have any questions, please let us know at law.moreinfo@nyu.edu. Harvard and Yale Law School would like to invite to you to participate in their Online Information Sessions. Participants will have an opportunity to submit questions about the universities curriculum, student life, and the admissions process. Follow the link to register for these events. Coming soon: The Pre-Law Internship Newsletter will be posted THIS WEDNESDAY, DECEMBER 5 over on our Compass page! Scholarships–Now is a great time to apply! Our info session will tell you everything you need to know about the benefits of attending a Fulbright UK Summer Institute and how to be a competitive applicant. We’ll also hear from previous Illinois recipients. DUE THIS SATURDAY, DEC. 8–University of Illinois Latina/Latino Alumni Association Scholarship. Open to Latina/Latino undergraduate and graduate students enrolled full-time at the University of Illinois at Urbana-Champaign during the 2018-2019 academic school year. In honor of our ten year anniversary and thanks to a generous donor, IllinoisLLAA is able to grant two $5,000 scholarships to either an undergraduate or graduate student, one of which is reserved for an undocumented student. Click here to apply. DUE DEC.31–Health and Wellness $2,000 Scholarship. Available to students enrolled at an accredited college or university. You must have at least a 3.4 GPA and submit an essay of 800-1000 words, promoting a practical approach to healthy lifestyle during college years and how these habits can be sustained over a lifetime. Additionally, you must demonstrate detailed knowledge of health and wellness and discuss why healthy living is a lifetime endeavor. Click here to apply. DUE JAN. 19–Virginia M. Wagner Educational Award. Open to female students in Illinois, Indiana, Kentucky, Michigan, Ohio, Wisconsin who are attending college/university in pursuit of a bachelors, masters, or doctoral degree. Click here to apply. The Bailey Undergraduate awards are $3000 awards ($1500/semester) given each year to undergraduate students at the University of Illinois who have demonstrated positive impact and commitment as a result of service, community involvement, leadership, and action. Financial need and academic achievement will also be considered. University of Illinois – Urbana campus undergraduate students in all programs are eligible to apply. Applications due February 15. For more information or to apply online, visit: www.universityymca.org/bailey Contact: Kasey Umland, Director, Bailey Scholarship Program, University YMCA 217.337.1514; baily@universityymca.org. DUE MARCH 19–Create-a-Greeting-Card $10,000 Scholarship. Open to currently enrolled high school and college students in the United States. To enter, you must design a holiday, get well, or birthday greeting card and submit your work to be judged. Your photo, art, or graphics submitted must be your own original work and you must be at least 14 years of age to be eligible for this award. Click here for more details. Interested in other scholarships? PLAS has collected information on over 150 scholarships–for both undergrads and incoming law students–on our Scholarships Spreadsheet over on our Pre-Law Compass page. It’s a wide variety of scholarships based on everything from being left-handed to making a video to tweeting, and deadlines vary, so check it out! Even though we have passed the midpoint of the semester, there is still a lot going on. Scroll down for info on law school admissions webinars by Harvard, NYU and Yale, a PAID internship opportunity, Pre-Law 101, law school open houses, the Udall Scholarship Program and more! This workshop is designed for incoming students who are new to pre-law or are interested in learning more about it. We will cover: What it means to be pre-law at Illinois, course selection, majors, and extracurriculars, building a pre-law resume, and what law schools are really looking for. We will outline a four year plan to maximize your undergraduate experiences in order to make a great law school candidate. We’ll also take any questions about law school and legal careers. This is the last Pre-Law 101 session for the fall semester. Incoming students should attend a Pre-Law 101 prior to setting up an individual pre-law advising appointment. Registration will be open until November 12 or until the session is full. Go here to register. Please RSVP by November 19 by clicking on this link. Workshops with 3 or fewer registrants may be cancelled and converted to individual appointments. In this session, Access Lex will discuss the costs of pursuing a legal education, describe the financial aid application process, review the available financing options and identify ways students can be financially prepared to achieve their goals. 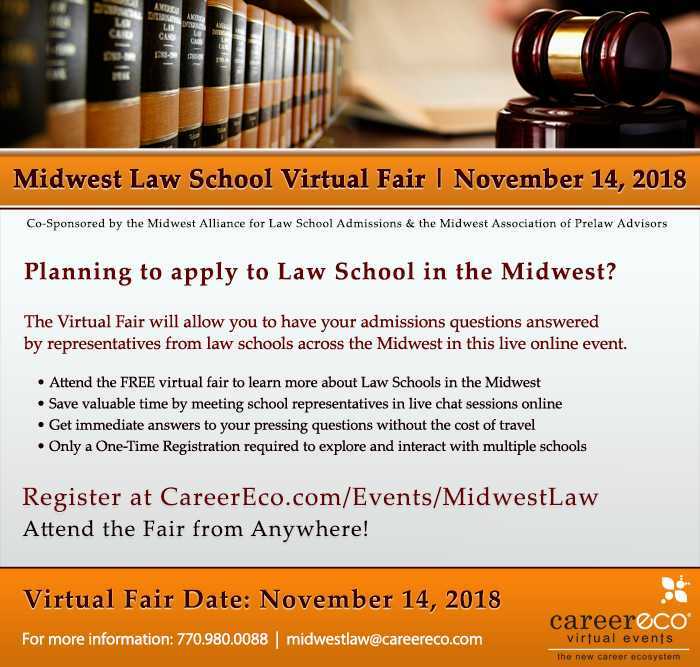 Midwest VIRTUAL Law Fair NEXT Wednesday, November 14! Were you unable to attend our Law School Fair? Over 25 Midwest law schools will be available to chat online with you about the admissions process, their schools, scholarships, journals, etc. This event is FREE and participants don’t need to travel! Click here for more information and to register. Some fall law school open house opportunities have already passed. Make sure you check the websites of your selected schools for these very helpful events. University of Chicago: Monday, November 19 (NOTE: That’s during Fall Break! ), from 1-5pm. Click here for more details. Chicago-Kent: THIS Saturday, November 10, 9:00am-12:30pm. Click here for more details. DePaul University: THIS Saturday, November 10 – 10:00 am-1:00 pm. Click here for more details. John Marshall: JMLS had their final Fall 2018 Open House this past Saturday, November 3. For information on scheduling a campus visit, click here. Loyola-Chicago: Information Sessions: Monday, November 19 (Note: That’s during Fall Break!) at 11:15 am; or Friday, November 30 at 12:15 pm. Click here fore more details. They are also hosting a November Open House: Admissions Strategies THIS Saturday, November 10. Click here for more details. Are you an Illinois undergraduate looking for your next internship experience? The National Center for Supercomputing Applications (NCSA) is looking for highly motivated, creative students to work on hands-on research projects with guidance from NCSA staff and faculty affiliates. The center will offer a limited number of paid SPIN (Students Pushing INnovation) internships during the the Summer 2019 session. The SPIN projects are open to students in any major and any year of study; international students can apply. Want to learn more? Come to our SPIN Open House! You’ll get to meet our NCSA staff and faculty affiliates and learn more about the different projects you could be a part of. Refreshments will be provided. Are you a passionate environmentalist? Do you want to devote your career to addressing environmental concerns? The University of Illinois seeks to nominate sophomores and juniors for the prestigious Udall Scholarship. The Udall awards $7,000 to sophomores or juniors who are taking action to address environmental concerns and are committed to a career related to the environment. Please note that there are special awards also for Native American students interested in tribal policy or health care (no need to be related to the environment). Students must be US citizens, US nationals, or US permanent residents. A successful applicant will have a GPA of 3.0 or higher and demonstrate leadership and a commitment to service. The University of Illinois may nominate up to six students for the Udall Scholarship. The campus deadline is February 7, 2019 to be considered. The Goldwater is for juniors or exceptional sophomores who are current U.S. citizens, U.S. nationals, or resident aliens. The Goldwater awards one- or two-year $7,500 awards to students who demonstrate strong evidence of contributing to the technological advances of the U.S. Applicants should be committed to pursuing a Ph.D in the research fields of mathematics, sciences, or engineering. Go here for more information. Interested in other scholarships? PLAS has collected information on over 200 scholarships–for both undergrads and incoming law students–on our Scholarships Spreadsheet over on our Pre-Law Compass page. It’s a wide variety of scholarships based on everything from being left-handed to making a video to tweeting, and deadlines vary, so check it out! This is part of our Applying to Law School webinar series for Illinois students and alumni. Register for this webinar by TOMORROW, October 16. Webinar link and handouts will be sent to registrants before the session. This workshop is designed for incoming students who are new to pre-law or are interested in learning more about it. We will cover: What it means to be pre-law at Illinois, course selection, majors, and extracurriculars, building a pre-law resume, and what law schools are really looking for. We will outline a four year plan to maximize your undergraduate experiences in order to make a great law school candidate. We’ll also take any questions about law school and legal careers. Click here to register for this event. Each Pre-Law 101 session is the same, so pick the one that best suits your schedule. Incoming students should attend a Pre-Law 101 prior to setting up an individual pre-law advising appointment. Registration will be open until October 19 or until the session is full. Go here to register. Some fall law school open house opportunities, including one this past weekend at Chicago-Kent, have already passed. Make sure you check the websites of your selected schools for these very helpful events. Loyola-Chicago: Information Sessions are offered TODAY Monday, October 15 at 11:15 am; Monday, November 19 (Note: That’s during Fall Break!) at 11:15 am; or Friday, November 30 at 12:15 pm. Click here fore more details. They are also hosting a November Open House: Admissions Strategies on Saturday, November 10. Click here for more details. The Goldwater is for juniors or exceptional sophomores who are current U.S. citizens, U.S. nationals, or resident aliens. The Goldwater awards one- or two-year $7,500 awards to students who demonstrate strong evidence of contributing to the technological advances of the U.S. Applicants should be committed to pursuing a Ph.D in the research fields of mathematics, sciences, or engineering. We have some BIG events coming up! Take a look. Pre-Law Events–Our Fall Event Calendar is posted! Here’s a preview of what’s coming up. Perfecting Your Personal Statement and Resume for Law School–TODAY, Monday, Sept.17, 4-5pm, 514 IUB. The personal statement is one of the most difficult yet powerful elements of the law school application. Join us for this workshop, which will cover what the personal statement is, how to prepare for writing it, and some tips and suggestions for making it reflect an applicant’s strengths. We will also discuss how the personal statement and resume can complement each other to create a stronger law school application. Law School Admissions Panel–Tuesday, Sept. 25, 7:00 pm in 1002 Lincoln Hall. Are you wondering what law school admissions professionals really look for in an applicant? How do they weigh LSAT scores, grades, or work experience? What gets their attention–and what would make them deny someone? Join us for this expert law school admissions panel to discover this and more. Participants will have the opportunity to ask questions. This is a must-see event for anyone considering applying to law school! Law School Fair–Wednesday, Sept. 26, 10:00 am-2:00 pm at the ARC (201 E. Peabody Drive) It’s the biggest pre-law event of the year as 110 law schools visit campus to meet all who are interested in applying to law school. Learn about law schools, scholarships, and the application process while meeting the people who will be reading your law school applications. Application fee waivers and other freebies will be available. Stop by or stay the whole time! This event is free and open to the public. For more information click here to visit our website. No registration required. Emory Law Interviews–Wednesday, Sept. 26, 3:00-5:00 pm, 504 Illini Union Bookstore Building. These are not formal interviews, but an opportunity for you to learn more about the programs offered at Emory Law, to discuss the law school admissions process in general, and to get all of your questions answered. If you would like to schedule an appointment, sign up for a time slot here: Emory Law Sign Up. Please be sure to bring a copy of your resume during your time slot. Click here to learn more about Emory Law. Law School Events–Pre-Law students are invited! Constitution Day 2018–TODAY, Sept. 17, at 7 pm in Lincoln Hall. Tolerance Means Dialogue: Religious Liberty and the Culture War over LGBT Rights: Can University Students Make a Difference? This moderated dialogue is open to the public. Click here for more details. The Kavanaugh Nomination and the Future of the Supreme Court–Sept. 18, 12:00-1:15 pm in the Law Building Max L. Rowe Auditorium. Panelists include Dean Vikram Amar, Andrew Leipold, Jason Mazzone, and Arden Rowell. Click here for more details. David F. Prindable Undergraduate PAID Internship at the Illinois Program for Research in the Humanities (IPRH): Communications and Undergraduate Outreach: Applications DUE Friday, September 28! Undergraduate majors in humanities disciplines are invited to apply for a paid internship in communications and undergraduate outreach at the Illinois Program for Research in the Humanities (IPRH), the campus humanities hub. The successful candidate will assist IPRH with its communications strategy, particularly its email communications and social-media presence, in addition to serving as a IPRH’s undergraduate liaison and chief strategist on undergraduate engagement. This position is funded thanks to a generous gift from David F. Prindable. To be considered for this internship, candidates must possess strong writing and communications skills, excellent attention to detail, the ability to work independently, and an investigative mind. A broad interest in the humanities is preferred. The position commences October 15, 2018 and ends May 15, 2019. The Prindable intern will work approximately two to three hours per week, for 24 weeks, at the rate of $15.75 per hour (up to $1,000 per year). There is flexibility regarding the hours to be worked. To apply, please email a one-page letter of interest, a resume, and a list of three references (academic or non-academic, so long as they can speak to your skills and work ethic; at least one referee should be able to comment on your writing skills) to iprh@illinois.edu by September 28 with “Prindable Internship” in the subject line. Letters may be addressed and questions directed to IPRH Deputy Director, Nancy Castro (ncastro@illinois.edu). Graphic Design Intern: The Illinois Office of Undergraduate Research is seeking a motivated and experienced undergraduate student to assist with creating innovative and visually impactful graphics for the office. The graphic design intern will be expected to work from 5 – 10 hours per week (workstation and required software will be provided). This is a PAID internship at $12/hour. Federal Work Study designation is required. Assist with layout, design, and production of flyers, digital/web graphics, office brochures, and other print/digital resources, consistent with current office branding. Assist with converting digital assets to web-ready formats. Interested in other internships? It’s NOT too early to start looking for spring/summer internships today! We post internships on our blog and our Facebook page. Check out this blog post for a plan on how to start finding spring and summer internships this fall. Now is a great time to check out–or join–all of our pre-law resources! Click the links to explore. You can also search this blog for posts about the LSAT, law school applications, resumes, internships, and more! We have updated our Spring Semester calendar of events! Upcoming PLAS programs include the FREE Practice LSAT on Friday, February 24, and the Negotiating Scholarships Workshop, featuring Rebecca Ray, Assistant Dean for Admissions and Financial Aid, at the UIUC College of Law, on Monday, February 27 at 5pm! For more information and to register for the practice LSAT, go to our website here. The Office of Inclusion & Intercultural Relations has posted its spring events! Check them out here. The Career Center has posted its spring workshop calendar on their website at: https://www.careercenter.illinois.edu/events. Now is a great time to update your resume, plan your job search or summer internship, and get to know their office and resources. This Friday, February 10, the Career Center is hosting a “Pizza & Professionals” lunch (with free pizza) on internships at Research Park. Scroll down for information about that and other upcoming workshops. Resume, Cover Letter and Linked In Reviews — Feb. 6, 2-4:30 pm Career Center; 7-9 pm Undergrad Library, Consultation Corner. There are multiple other dates and times for this workshop. Go here to see more options. Student Affairs internships are now available! Many internships are available at various sites on campus including: Asian American Cultural Center, Campus Recreation, Illinois Leadership Center, Office of Volunteer Programs, and Office of the Vice Chancellor for Student Affairs. Explore these internship opportunities on their website here. PAID internship opportunity in Chicago – The deadline to apply is TODAY Monday February 6th! The United States District Court for the Northern District of Illinois has paid internship opportunities for students in the court areas of Judicial Services, Operation Services, Administrative Services, and the Computer Systems Department. For more information and to apply, go here. We hope you have been utilizing our 20 page Internship Newsletter over on our Pre-Law Compass page that we posted in December! (Click here for instructions on how to access our Compass page.) It’s got lots of job and internship listings for spring, summer and long-term opportunities from Champaign to D.C. and beyond. In addition, you should regularly check iLink to see if summer internships have been posted there. The ABA Diversity Scholarship is designed for underrepresented students who demonstrate financial need and community involvement. Awards will be $15,000 for entering law students, which is renewable for years 2 and 3 of law school. Applicants must be entering law school in 2017 and submit an application, personal statement, and statement of financial need by March 2. Find the application and more details here. law school fair featuring admissions representatives from law schools around the country. Click here for a list of law schools that are registered for this year’s event. This workshop is designed for incoming students who are new to pre-law or are interested in learning more about it. We will cover: what it means to be pre-law at Illinois; course selection, majors, and extracurriculars; building a pre-law resume; and what law schools are really looking for. We will outline a four year plan to maximize your undergraduate experiences in order to make a great law school candidate. We’ll also take any questions about law school and legal careers. Although registration for this event has closed, we will be able to accommodate students on a first-come, first served basis. Each Pre-Law 101 session is the same. Incoming students should attend a Pre-Law 101 session prior to setting up an individual pre-law advising appointment. The personal statement is one of the most difficult yet powerful elements of the law school application. Join us for this workshop, which will cover: What the personal statement is, how to prepare for writing it, and some tips and suggestions for making it reflect an applicant’s strengths. We will also discuss how the personal statement and resume can complement each other to create a stronger law school application. Please click on this link to register so that we can ensure enough seating and materials for everyone. Undergraduate Research Apprenticeship Program — Deadline Wednesday, November 2! Now in its second year of collaboration, the Office of Undergraduate Research (OUR) and the Graduate College offer the opportunity for first and second-year undergraduate students (including transfer students) to assist advanced graduate students (those who have completed all coursework requirements and are in the dissertation research stage) with their research projects. Through a one-on-one research experience with their graduate student mentor, undergraduate students will have the opportunity to learn what it means to do research, create knowledge, and produce scholarship. Undergraduate students will begin work with their mentors in Spring 2017. Deadline for application is November 2, 2016. Questions may be addressed to: ugresearch@illinois.edu; please put “URAP” in the subject line. Want to meet law school admissions people and learn more about the stress-inducing personal statement? Wake Forest University School of Law will be coming to deliver a presentation on how to craft a strong personal statement as well as provide tips on how to approach the law school application process. All pre-law students are welcome so mark your calendars and take advantage of this great opportunity! More Career Center events and times are listed on their website. Click on this link to see what other programs are being offered! To chat live with an admissions officer, plan ahead to join our online information sessions this fall. We strive to offer all applicants at least one opportunity to join these online sessions with an admissions officer in order to ask questions about our programs, the admissions process, or application procedures in a public forum. Go here for more info and to participate in this event. As we explained in an earlier blog post, most law schools will offer tours or open houses for prospective applicants. Upcoming events include the following Open Houses: the University of Chicago Law School – Monday, November 21; DePaul University College of Law – Saturday, November 12; John Marshall Law School – Saturday, November 19. For more information check out the blog post or go to our Compass page for a list of such events at several Illinois law schools. You can find it by going to Compass and clicking on the “Applying to Law School” tab. It is the first item in that section. Fall break is usually a good time to attend one of these events or to contact the schools to arrange a visit so make your plans now!